​The park has one of the deepest lakes in Ontario, and features over 260 native pictographs – the largest visible collection in Canada. Spend a day or plan overnight adventures in this hiking and canoeing paradise of deep, blue lakes, sandy beaches, granite outcrops and lush green forests. Campsites available. Some summer events include: Sciensational Sssnakes interative presentations; Join songwriter & children’s entertainer David Archibald; Learn to take better nature photos with Bill Bickle, 2012 Canadian Wildlife Photographer of the year. Recreational Equipment Rentals available: Bicycles, kayaks, canoes, stand-up paddle boards, paddle boats—take your pick; they are all available to rent at the marina. Programming (movie/interpretation nights) will be expanded and offered in most campgrounds and children’s programming will also be offered Wed through Sun during Jul and Aug.
Campers can take advantage of 40% off admission to our heritage attractions Upper Canada Village and Fort Henry. New – the Discovery Centre, provides a background on the early settlement of our region and the influential role played by the St. Lawrence River. See state-of-the-art interactive exhibits, historical images and artefacts on display. Join us as Kingston’s history is brought to life on First Capital Day! Celebrating our unique past as the Capital of the United Provinces; students from Kindergarten to Grade 8 and beyond are invited to immerse themselves in free hands-on historical displays and activities. This event is open to school groups and the general public. ​The award winning Fort Henry National Historic Site offers a grade 7 and 8 Ontario curriculum based learning plan, hosted in the place where the history lesson began! 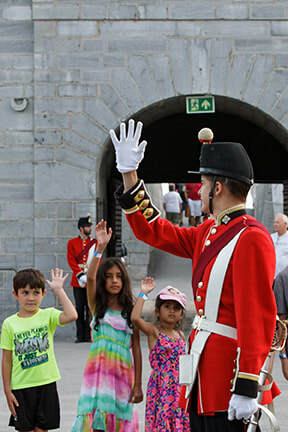 From one hour to a full day of the most exciting overnight program ever, Fort Henry takes students out of the classroom and into the past through a fun, interactive, hands-on program. All programs meet Ontario Curriculum Guidelines. A wonderful place to camp, backpack, hike, canoe, camp and observe nature. The Wilderness Skills Program teaches valuable outdoor skills. Skills Training Programs offered. Highway 401 east to Kingston. Then take Exit 613 – Sydenham Road – go north. ​Acres of strawberries and more! Fruition Farm is located just 10 minutes from downtown Kingston. Pick-your-own strawberries, raspberries and other fruits and vegetables in season. Our Corn Maze and pick-your-own Pumpkin Patch open in early Fall and continue until Halloween. ​Take a self-guided tour on a marked trail to several natural points of interest, like Devil’s Horsestable Cave. Descend 7.5 metres to the depths of the Hell Hole that widens into a cavern (bring a flashlight). Cross a natural stone bridge. Adventure downward below the bridge and notice the atmosphere of a miniature-like rainforest. You may even hear about the tale of the headless horseman seen in this locality! Accessible by foot only. Also available: mini-golf, snack bar and picnic area. Located: From Hwy 401, exit #579 north on County Rd 41 for 10.7 km, turn right at Centreville Rd, continue 5.5 km following signs. Get the most out of your group's visit to Kingston and the 1000 Islands with K-Pass: your all-inclusive ticket to savings on Cruises, Trolley Tours, Museums and more. Get a discounted bundle of 24h, 48h or 72h passes to explore Kingston independently, or choose a curriculum-linked group itinerary featuring Kingston's top historic sites and experiences. Experience the spectacular scenery and history of the 1000 Islands on a Sightseeing, Lunch or Dinner Cruise departing from historic downtown Kingston, just steps away from Market Square, Confederation Park and Princess St. Group rates available for 20 guests or more, or charter a ship especially for your larger group. Kingston 1000 Islands Cruises participates in K-Pass. 3-screen drive-in movie theatre with first run movies, 1/4 mile Go-Kart track, 6-man batting tent, 18-hole mini putt, Ferris wheel, tilt-a-whirl, merry-go-round, bumper boats, Safari train, kiddie cars, scrambler, Octopus, kiddie planes, kiddie coaster, Giant slide, all this fun at one location. Ask about birthday parties. 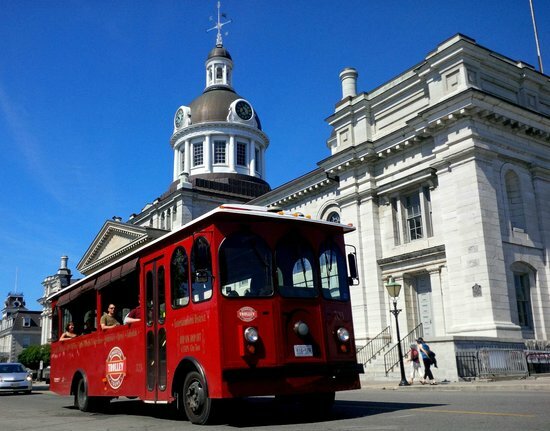 Let Kingston’s Red Trolleys be your guide to exploring Canada’s first capital. Hop On and Hop Off from ten stops at Kingston's top museums and attractions, including Fort Henry, Canada’s Penitentiary Museum, and Bellevue House. Or: charter a trolley especially for your group. 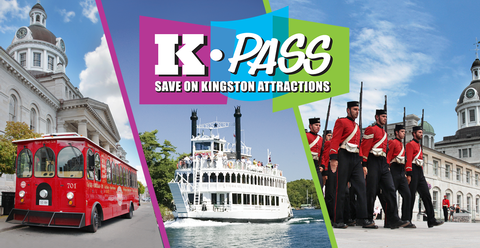 Kingston Trolley Tours participates in K-Pass. It's an easy A! Movies Make Learning Fun. A wonderful area to appreciate the outdoors and enjoy a picnic. Summer programs include, Day camps, many trails. The Outdoor Centre programs for families resume in the Fall. summer months, closed for weekends & holidays. Entry fees during July and Aug, are reduced to $5.00 per car. An indoor 12,000 square feet play facility of bright and colourful multi-level climbing structures, interactive games and climbing wall. Half Price Thursdays – see website for details. Birthday parties and group packages. Summer Camps. Socks are mandatory for everyone. Restaurant on site. Located: 541 Days Rd. at Bath Rd. From early telephones and Morse code to satellites and secret codes, the Military Communications and Electronics Museum proudly displays the achievements of Canada’s Military Communications and Electronics Branch. From the First World War to UN Peacekeeping operations of today. Education Programs $2 per student. Improbable Escapes Camp X Escape Room: $12 per participant. 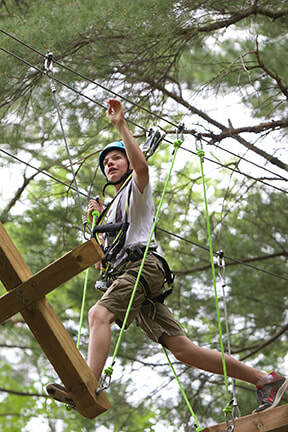 Activities include a guided Zip Line Tour; accessible Discover Zip Line; Adventure Courses - a series of five aerial games courses that increase in difficulty; Discovery Courses - two confidence building routes of easy balance games and a TREEWALK Village- tree houses connected by ramps, bridges, nets and slides and tree-wee mini obstacle course and zip line gliding swings.